1 A None No Power Seat 1 A is a standard Euro Traveller seat that has been converted to a Club Europe seat by blocking out the middle seat. The proximity to the lavatory and galley may be bothersome.The tray tables are in the armrests, making them immovable and slightly reducing seat width. 1 C None No Power Seat 1 C is a standard Euro Traveller seat that has been converted to a Club Europe seat by blocking out the middle seat. The proximity to the lavatory and galley may be bothersome.The tray tables are in the armrests, making them immovable and slightly reducing seat width. 1 D None No Power Seat 1 D is a standard Euro Traveller seat that has been converted to a Club Europe seat by blocking out the middle seat. The proximity to the lavatory and galley may be bothersome.The tray tables are in the armrests, making them immovable and slightly reducing seat width. 1 F None No Power Seat 1 F is a standard Euro Traveller seat that has been converted to a Club Europe seat by blocking out the middle seat. The proximity to the lavatory and galley may be bothersome.The tray tables are in the armrests, making them immovable and slightly reducing seat width. 10 A None No Power Seat 10 A is a standard Club Europe seat that has extra legroom however, there is no window-side armrest which can be bothersome. 10 B None No Power Seat 10 B is a standard Club Europe seat that has extra legroom due to the exit. 10 C None No Power Seat 10 C is a standard Club Europe seat that has extra legroom due to the exit. 10 D None No Power Seat 10 D is a standard Club Europe seat that has extra legroom due to the exit. 10 E None No Power Seat 10 E is a standard Club Europe seat that has extra legroom due to the exit. 10 F None No Power Seat 10 F is a standard Club Europe seat that has extra legroom however, there is no window-side armrest which can be bothersome. 11 A None No Power Seat 11 A is a standard Euro Traveller seat. 11 B None No Power Seat 11 B is a standard Euro Traveller seat. 11 C None No Power Seat 11 C is a standard Euro Traveller seat. 11 D None No Power Seat 11 D is a standard Euro Traveller seat. 11 E None No Power Seat 11 E is a standard Euro Traveller seat. 11 F None No Power Seat 11 F is a standard Euro Traveller seat. 12 A None No Power Seat 12 A is a standard Euro Traveller seat. 12 B None No Power Seat 12 B is a standard Euro Traveller seat. 12 C None No Power Seat 12 C is a standard Euro Traveller seat. 12 D None No Power Seat 12 D is a standard Euro Traveller seat. 12 E None No Power Seat 12 E is a standard Euro Traveller seat. 12 F None No Power Seat 12 F is a standard Euro Traveller seat. 13 A None No Power Seat 13 A is a standard Euro Traveller seat. 13 B None No Power Seat 13 B is a standard Euro Traveller seat. 13 C None No Power Seat 13 C is a standard Euro Traveller seat. 13 D None No Power Seat 13 D is a standard Euro Traveller seat. 13 E None No Power Seat 13 E is a standard Euro Traveller seat. 13 F None No Power Seat 13 F is a standard Euro Traveller seat. 14 E None No Power Seat 14 E is a standard Euro Traveller seat. 14 F None No Power Seat 14 F is a standard Euro Traveller seat. 15 F None No Power Seat 15 F is a standard Euro Traveller seat. 16 F None No Power Seat 16 F is a standard Euro Traveller seat. 2 F None No Power Seat 2 F is a standard Club Europe seat. 21 F None No Power Seat 21 F is a standard Euro Traveller seat. 22 A None No Power Seat 22 A is a standard Euro Traveller seat. 22 B None No Power Seat 22 B is a standard Euro Traveller seat. 22 C None No Power Seat 22 C is a standard Euro Traveller seat. 22 D None No Power Seat 22 D is a standard Euro Traveller seat. 22 E None No Power Seat 22 E is a standard Euro Traveller seat. 22 F None No Power Seat 22 F is a standard Euro Traveller seat. 23 A None No Power Seat 23 A is a standard Euro Traveller seat. 23 B None No Power Seat 23 B is a standard Euro Traveller seat. 23 C None No Power Seat 23 C is a standard Euro Traveller seat. 23 D None No Power Seat 23 D is a standard Euro Traveller seat that may have slightly limited recline. The proximity to the lavatory may be bothersome. 23 E None No Power Seat 23 E is a standard Euro Traveller seat that may have slightly limited recline. The proximity to the lavatory may be bothersome. 23 F None No Power Seat 23 F is a standard Euro Traveller seat that may have slightly limited recline. The proximity to the lavatory may be bothersome. 24 C None No Power Seat 24 C is a standard Euro Traveller seat however, the proximity to the lavatory may be bothersome. 25 A None No Power Seat 25 A is a standard Euro Traveller seat however, the proximity to the lavatory and galley may be bothersome. This seat is also missing a window. 25 B None No Power Seat 25 B is a standard Euro Traveller seat however, the proximity to the lavatory and galley may be bothersome. 3 F None No Power Seat 3 F is a standard Club Europe seat. 4 A None No Power Seat 4 A has extra legroom and width. This plane has a movable divider between the Club Europe and Euro Traveller sections, so many configurations are possible. 4 B None No Power Seat 4 B is a standard Club Europe seat however, this seat is convertible to the Euro Traveller configuration. This plane has a movable divider between the Club Europe and Euro Traveller sections, so many configurations are possible. There are gaps in the middle and at the sides of this seat making it very uncomfortable. 4 C None No Power Seat 4 C has extra legroom and width. This plane has a movable divider between the Club Europe and Euro Traveller sections, so many configurations are possible. 4 D None No Power Seat 4 D has extra legroom and width. This plane has a movable divider between the Club Europe and Euro Traveller sections, so many configurations are possible. 4 E None No Power Seat 4 E is a standard Club Europe seat however, this seat is convertible to the Euro Traveller configuration. This plane has a movable divider between the Club Europe and Euro Traveller sections, so many configurations are possible. There are gaps in the middle and at the sides of this seat making it very uncomfortable. 4 F None No Power Seat 4 F has extra legroom and width. This plane has a movable divider between the Club Europe and Euro Traveller sections, so many configurations are possible. 5 B None No Power Seat 5 B is a standard Club Europe seat however, this seat is convertible to the Euro Traveller configuration. This plane has a movable divider between the Club Europe and Euro Traveller sections, so many configurations are possible. There are gaps in the middle and at the sides of this seat making it very uncomfortable. 5 E None No Power Seat 5 E is a standard Club Europe seat however, this seat is convertible to the Euro Traveller configuration. This plane has a movable divider between the Club Europe and Euro Traveller sections, so many configurations are possible. There are gaps in the middle and at the sides of this seat making it very uncomfortable. 5 F None No Power Seat 5 F is a standard Club Europe seat. 6 B None No Power Seat 6 B is a standard Club Europe seat however, this seat is convertible to the Euro Traveller configuration. This plane has a movable divider between the Club Europe and Euro Traveller sections, so many configurations are possible. There are gaps in the middle and at the sides of this seat making it very uncomfortable. 6 E None No Power Seat 6 E is a standard Club Europe seat however, this seat is convertible to the Euro Traveller configuration. This plane has a movable divider between the Club Europe and Euro Traveller sections, so many configurations are possible. There are gaps in the middle and at the sides of this seat making it very uncomfortable. 6 F None No Power Seat 6 F is a standard Club Europe seat. 7 B None No Power Seat 7 B is a standard Club Europe seat however, this seat is convertible to the Euro Traveller configuration. This plane has a movable divider between the Club Europe and Euro Traveller sections, so many configurations are possible. There are gaps in the middle and at the sides of this seat making it very uncomfortable. 7 E None No Power Seat 7 E is a standard Club Europe seat however, this seat is convertible to the Euro Traveller configuration. This plane has a movable divider between the Club Europe and Euro Traveller sections, so many configurations are possible. There are gaps in the middle and at the sides of this seat making it very uncomfortable. 7 F None No Power Seat 7 F is a standard Club Europe seat. 8 B None No Power Seat 8 B is a standard Club Europe seat however, this seat is convertible to the Euro Traveller configuration. This plane has a movable divider between the Club Europe and Euro Traveller sections, so many configurations are possible. There are gaps in the middle and at the sides of this seat making it very uncomfortable. 8 E None No Power Seat 8 E is a standard Club Europe seat however, this seat is convertible to the Euro Traveller configuration. This plane has a movable divider between the Club Europe and Euro Traveller sections, so many configurations are possible. There are gaps in the middle and at the sides of this seat making it very uncomfortable. 8 F None No Power Seat 8 F is a standard Club Europe seat. 9 A None No Power Seat 9 A is a standard Club Europe seat that does not recline due to the exit behind. 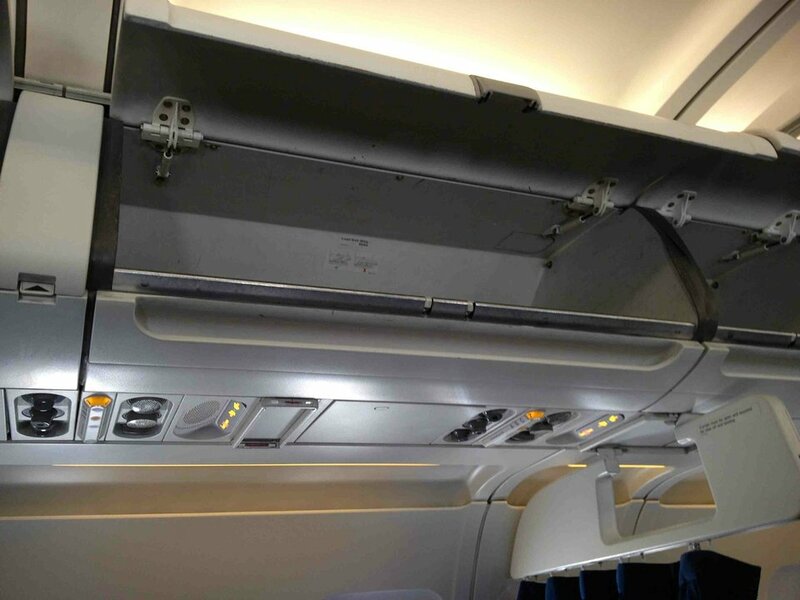 It has been reported by passengers that this row is missing air vents and tends to get warm. 9 B None No Power Seat 9 B is a standard Club Europe seat that does not recline due to the exit behind. It has been reported by passengers that this row is missing air vents and tends to get warm. 9 C None No Power Seat 9 C is a standard Club Europe seat that does not recline due to the exit behind. It has been reported by passengers that this row is missing air vents and tends to get warm. 9 D None No Power Seat 9 D is a standard Club Europe seat that does not recline due to the exit behind. It has been reported by passengers that this row is missing air vents and tends to get warm. 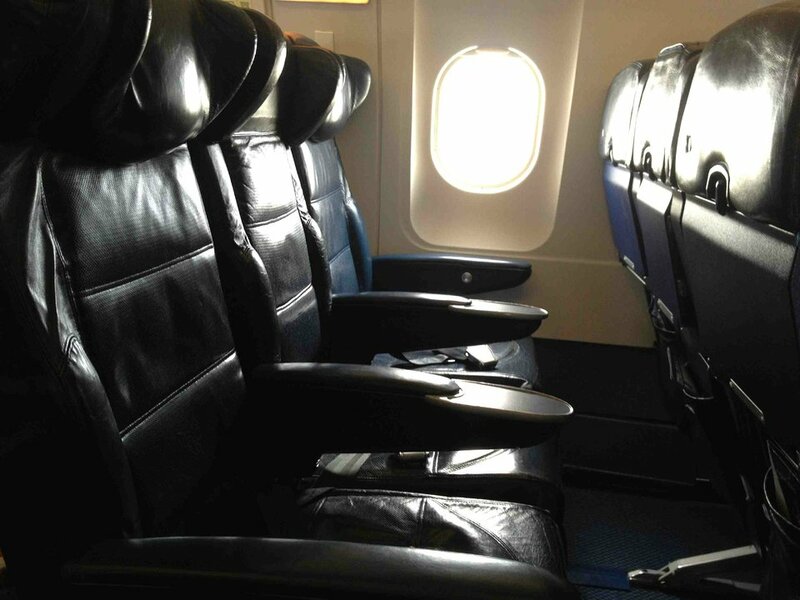 9 E None No Power Seat 9 E is a standard Club Europe seat that does not recline due to the exit behind. 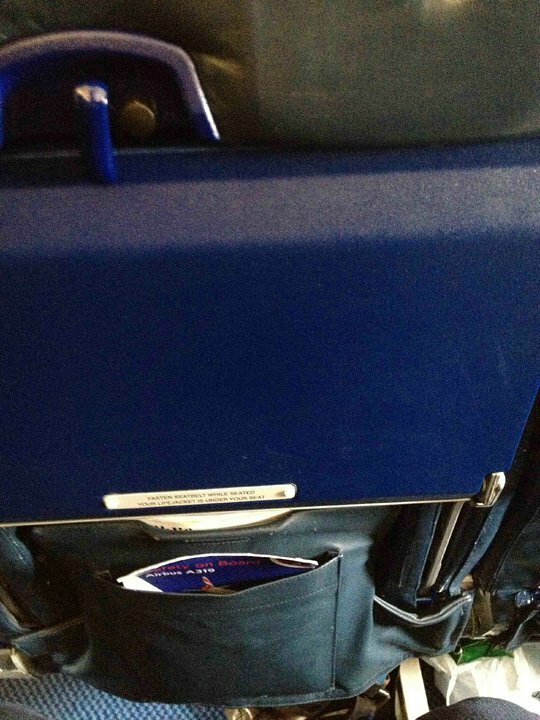 It has been reported by passengers that this row is missing air vents and tends to get warm. 9 F None No Power Seat 9 F is a standard Club Europe seat that does not recline due to the exit behind. It has been reported by passengers that this row is missing air vents and tends to get warm. This British Airways Airbus A319 is primarily operated on short-haul European routes. This A319 features a two class configuration with between 12-40 Club Europe seats and 83-125 Euro Traveller seats. The Club Europe seats are standard Euro Traveller seats with the middle seat blocked off. This plane has a movable divider between the Club Europe and Euro Traveller sections, so many configurations are possible. This row does not have air vents. We could have done with them as became rather warm. Row 4 does not have ANY extra legroom on this very cramped business class cabin. Only row 1 has any extra room. I would change row 1 seats from yellow to green as they are the BEST seats on this aircraft. Very disappointing seat, as i am 6ft.2, i found this trip very cramped and my knees where well and truly forced into the back of the seat in front. So glad it was only to Alicante, would not be able to fly to Greece/Canary Islands for 4 hours + on one of these planes. save your legs fly low cost airline instead. The plane was very old but the seats new. I liked the Business class the seats were very comfortable. 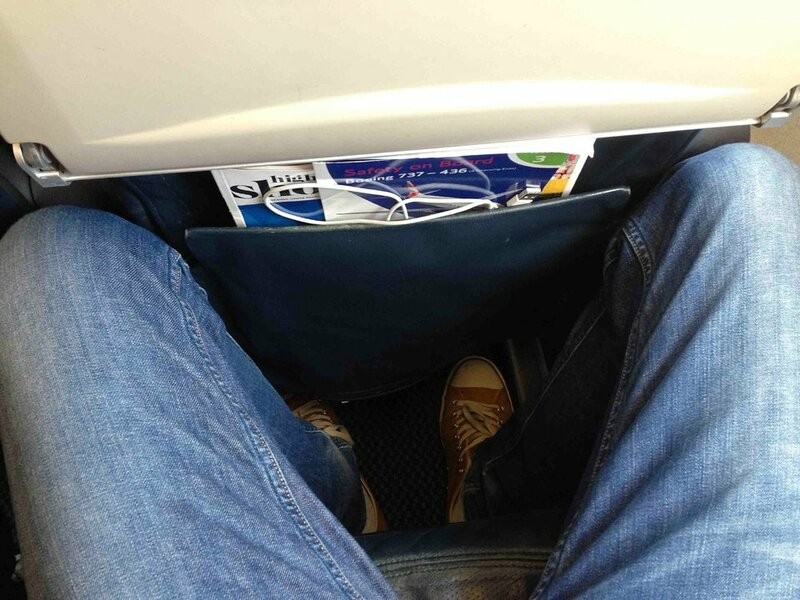 The legroom wasn´t that good but all in all a good place to sit! BA has reduced the seat pitch to 29" on their European short haul routes. This comment applies to the A319 European configuration. I'm a 6'3" tall passenger and the 29" legroom was almost criminal. My knees were jammed into the seat back in front of me. Avoid this aircraft configuration if you can. No recline due to fixed toilet structure behind. Constant flow of people brushing past when sat in the aisle seat. BA have removed a toilet in economy to make space for seats in row 24 and 25 meaning there is only one economy toilet, disgraceful! all seats in row 16 have about 3ins shorter pitch than the other seats. These are all bad seats. I am 6 ft and could only stick my knees into the chair ahead or put them in the passageway. The reason is that in the configuration the seats would be out-of-line with the overhead buttons unless they take these 3 inches at this row. The crew obviously know all about this and avoid talking to this row. The Captain told me BA only offer an average seat pitch - some are bigger and some smaller. It is a disgrace. Seat 25A is a disgrace. I'm not tall (1.78m / 5ft10) and found that I was hunched up the whole journey, perhaps it's the curvature at the rear of the fuselage that does it. Without any window, it's all a bit dark and you can't see what's going on outside. Anyone who has a problem with confined spaces will suffer genuine distress in this seat. Unbelievably uncomfortable in new configuration, no leg rom at all. First time i have not had an emergency exit seat, never again, worst seat in all the years i have been travelling. The trip went really smoothly, but a curtain separates the two classes for privacy, at the unfortunate cost of covering the overhead TV screen. The row happened to be right in front of the curtain. This makes it hard to view the TV screen. Since the flight was just 40 minutes this was only a minor annoyance, but on longer flights this can be a big problem. I paid extra for club Europe Munich lounge was scruffy and lacked adequate staff to collect cups and glasses. Seat was the most unpleasant business seat I have ever used, I felt the legs of the person in 6C and not worth the extra £350. 81cm distance to front seat, seat located at exit doors. Free upgrade due to overlapping reservation for booked seat at gangway. space is good for for person up to 190cm height. Space of 66cm to front seat, not enough space for long legs, but ok for 1h flight. 250 Euro too much for such a seat. Airbus 319 AMS to LGW 2016/05/02 Club Europe rows 1 to 4. Rows 5 and 6 in Club config but assigned to Economy. Full size Economy centre seats started at row 7. As SeatGuru states - B & E Club VERY uncomfortable when in Economy. The pitch in business class wouldn't qualify as a decent economy flight in the US. If the person in front of you reclines, your table is worthless. Nice seats in the front of the plane. Enough space for me with 180cm/120kg. The middle seat is empty and got a table. Service was also fine. I flew DUS-LHR in C and was shocked to see the complete lack of legroom even in C. I did read about BA squeezing more seats into the A319, but why punish high paying C customers ? Thankfully,the guy in 4D did not recline his seat, otherwise the situation would have been even worse. Ok experience on BA Club Europe. Food actually edible this time, (surprising for BA), but legroom no different from economy. The seat was fine for a 2 hour flight from London to Nice, but not more. Would not pay a lot more to fly BA Club on European routes again, but would definitely purchase if buying w/avios. Avoid row 9 - no recline and no air vents making for a very uncomfortable journey, especially if the seat in front reclines. I paid to select these seats and very much regret it. Row 11 is missing overhead air vents for some reason ("gaspers"), making it very stuffy and warm. There is no window for this row 25A and 25B Very dark and claustrophobic ! Directly opposite toilet. Seats narrower in width compared to row in front. Disappointing. Row 9 in 5his aircraft has no overhead air nozzles. Unlike all the other rows i could see. This made for an exceptionally hot journey to hamburg with ba. I paid an additional fee for the extra leg room in seat 4C on this flight from London to Rome only to discover upon boarding that row 4 has no additional leg room and was the equivalent of a discounted economy seat, except that the middle seat remained empty. The seat is not at all suitable for a tall passenger and should not be rated as a standard business class seat. The seat pitch seemed dramatically less than the 31-34 inch range. I'd say more like 28 or 29 inches. I don't think I have ever sat in a more cramped seat. Flew on 6/23/15 from LHR to ARN (Stockholm) in 2D in Business Class. Service was great. Legroom was OK for me. The food was very good. Big suprise as the food inside Europe on BA is NOT good at all. Not a competitive business class product. The legroom is exactly the same as in economy. Will not use this service again. 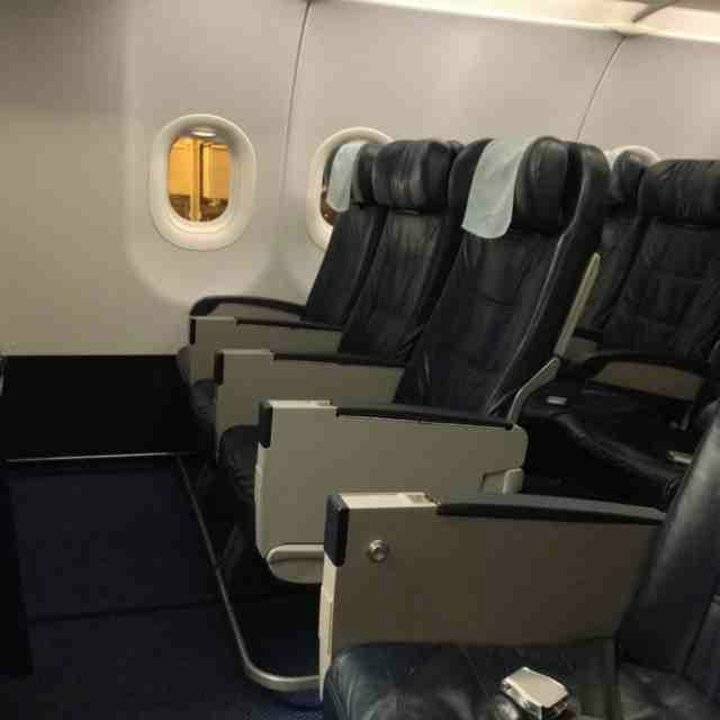 on 10/4/15 boarded a BA A319 'Club Europe' to Malta, only to find the seats are exactly the same dimensions as standard economy (Euro Traveller) albeit the middle seat is left empty and the back drops to make a tray. BA,s website clearly shows a 2 seat configuration when booking, when in fact it is 3, with No extra Legroom or width in the seat. You pay a premium for a Club seat when what you get is a Standard Euro seat. At best it is misleading and very disappointing that BA chooses not to show the correct seating arrangements I would have expected better from them. Of course you only find this out once you have boarded and are committed to a uncomfortable three+ hour flight. Don't bother with Club class you will waste your money. Not too loud. Good view. These so called club europe seats are incredibly cramped for a nearly five hour journey, especially trying to eat when someone in front puts their seat back. Flew LHR to DUB. Standard limited leg room. Crew was extremely efficient and served a good cup of hot tea and biscuits (cookies). Flew the same plane in 12C on the return. Again, nothing sensational, but the crew was efficient once again. I'm 1.93m tall and the window next to 21A - and from my observation all the window seats in odd rows from 11 to the back - is just in the position that my shoulder doesn't touch the wall. On a few past flights in this seat, 21B was not occupied, which made this seat even nicer. I had no problem at all with this seat. For only a 1 and a half hour flight to Madrid the limited recline wasn't a problem. It was even better for me as I only had hand luggage so could just wait, whilst gaming on my phone, for everyone else to leave. Ideal if you're not in a rush.